“Space, the final frontier…” I don’t remember how old I was when I first heard James Tiberius Kirk utter those immortal words; but their haunting, almost poetic refrain has stayed with me ever since. I couldn’t have been more than seven, because I made my dad (I say made, but he would have taken me anyway because he was a die-hard Trekkie) take me to see ‘Star Trek: The Motion Picture’ when it was first released on the big screen way back in ’79 /’80, and from that moment on, I was captivated. Star Trek became a major part of my life, and James T. Kirk became one third of my illustrious trio (along with Han Solo and The Doctor) of intergalactic heroes, where he resides to this day; and, just in case you’re wondering, so do The Doctor and Han Solo. 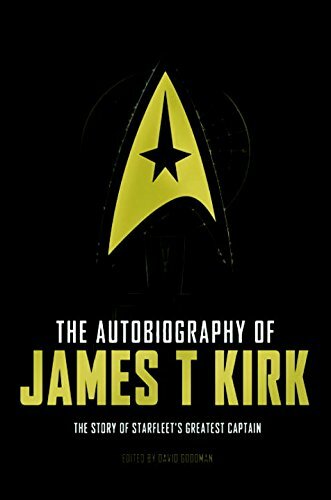 So, when ‘The Autobiography of James T. Kirk’ arrived, I had no choice, I had to dive into it straight away because if there was anything else to learn about one of my cherished heroes, then by Jupiter’s second moon, I was going to learn it and I was going to learn it as quickly as I could. Which I did. 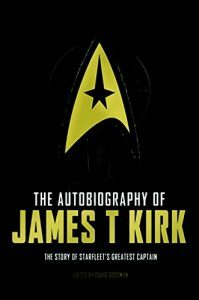 Ostensibly written by Kirk himself, and “edited” by David A. Goodman, ‘The Story of Starfleet’s Greatest Captain’ fills in the blanks and gaps in his life to which both TOS and the films alluded and, at times, drew influence from. Told in his “own” words, it follows him from Earth to Tarsus IV, where he barely escapes the clutches of Governor Kodos, follows him through the Academy, charts his early career and covers all of the relationships that helped forge his character and made him who he was. Veering between wistful remembrance and regret at lovers, colleagues and friends lost – be that to his career or the choices he made – ‘The Autobiography’ presents a thoughtful examination of everything he achieved, saw and did during his time in the Uniform, painting a decidedly different portrait of the man most at ease in the Enterprise’s big chair than you might expect. Rather than the macho, egotistical misogynist he’s often mistaken for by non-believers, it shows him for who he really was, a man driven by duty, honour and a desire to reach as far as he could during his lifetime. And every single paragraph on every single page just reinforces my faith in my hero.